Written by Marion Pouzoulet. International Facilitation WSF 2020. 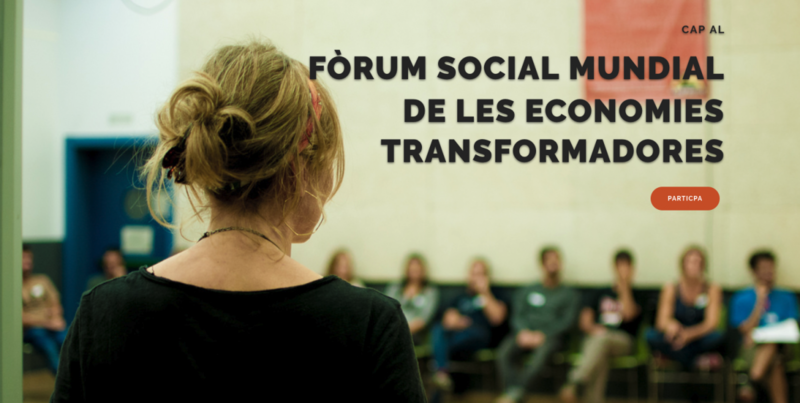 As a reminder, the World Social Forum of Transformative Economies will take place in Barcelona in 2020. The event – and especially the build-up towards it – intends to be a huge step forward in connecting and involving movements and transformative practices that are changing the economic system in their communities all over the planet. More than Another World is possible, we affirm that “another world already exists”, and is being made by different practical visions of alter-globalization movements and by the renewal of long historical traditions such as co-operativism and community economies. The Forum is proposing to start with 4 streams of converging movements: Feminist Economies and gender perspective; Agroecological Movements and Food Sovereignty; Natural, urban, knowledge and digital Commons; and Social Solidarity Economies (including fair trade, co-operativism and ethical finance). Step by step, the main goal is to recognize the complementarities and common objectives, in order to converge to provide the answers to global challenges we will have chosen to tackle together. Transversal dimensions of public policy and education and research have already begun to emerge and others will be defined in the process. From the 5th to the 7th of April 2019, a large preparatory meeting will be held in Barcelona. The aim will be to discuss and validate the governance of the Forum and process, its working methodology, and the specific goals for the 2020 Forum. It will do so with representatives of the different movements, and from local and international networks and organizations. The operational team of the Forum is currently mapping organizations, to invite them to participate in this first phase. We count on you to continue making contributions from organizations / movements / networks from each continent and sectors that are key to joining this process of convergence. Participate in the convergence spaces of Transformative Economies: these have begun to organize and work, mainly from the Barcelona base for the moment. Their main objective is now focusing on mapping the actors (organizations, networks, movements) to be involved in the process, and start defining objectives for the 2019 and 2020 meetings. Each space will have a local facilitator and one (or more) international facilitators. Interaction will take place mainly through an online platform that will soon be launched. Local convergences: these are territorial dynamics that bring together the different approaches to transformive economies and who decide to work together to foster their participation and contribution to the Forum process. The International Promotion Committee: this is the meeting place for the large international networks that promote transformative economies. RIPESS is leading this space for this launching phase, establishing contacts with the different movements to jointly evaluate the best moment to get involved in the process and in which capacity. In order to provide more detailed orientations for local processes (both for local territorial convergences, and the transformative economies spaces), an “infopack” is being drafted and will soon be published. Local convergences in Barcelona are eager to exchange with similar processes in other territories and with international movements. The forum is calling for diversity of networks, movements and initiatives that identify themselves as transformative practices to join the process. Visit: www.transformadora.org, follow the Facebook page and Twitter account, or subscribe to the newsletter. Feel free to contact the working team at hola@transformadora.org and they will suggest the best way for you to participate.